Recently a HADAS researcher, ALBERT DEAN, has been working at the British Library Newspaper section in Colindale, examining the local press of Hendon and Finchley at the end of the last century. As often happens in this kind of research, Albert found himself wandering down all kinds of unexpected byeways. Luckily, he took photocopies of some of his more interesting finds. We hope to publish them from time to time in the Newsletter. Here, to start with, are some descriptions of Christmas shopping in Victorian Hendon and Finchley, complete with flowery language and even the occasional Shakespearian quotation. '"Contrast this description with the appearance of Mr Goldfinch's shop, with its plate-glass windows and showcases, mahogany counters and innumerable rows of stoppered jars, whose nomenclature beggars description. We ought to be thankful in Hendon that so excellent an establishment exists, and that whatever prescription is ordered by the faculty can be made up without delay. But apart from the sale of drugs, no doubt very essential to the health of the community, Mr Goldfinch has numbers of cosmetics, scents, pomades, brushes, etc. Moreover he is, we fancy, the only tradesman that keeps in stock those mineral waters which just now are in great demand, such as soda, potash, apollinaris, carlsbad, friedrichshall, pullna, lithia, seltzer, vichy, vals and hunyadi-janos. Mr Goldfinch has for many years carried on a high class trade in Christmas cards, many of them designed and manufactured by himself, and equal to the works of Marcus Ward and de la Rue. Chromos, oleographs and other pleasing articles are in stock, so for presents Mr Goldfinch's shop ought to be much sought after, and we wish him a rapid diminution in the articles he has for sale." Mr'Goldfinch's shop was clearly quite something, for a year later, in 1877, an article in similarly glowing terms appeared, in which Mr Goldfinch was credited with specialising in scent. "He has been dis­tilling a supply of the celebrated Hendon Floral Bouquet, which is prepared solely by this tradesman, and has a reputation far beyond the limits of the place. Of course a supply of the famous Jockey Club, Rondoletia, Millfleure, KissMeQuick, Frangipanni, Eau de Cologne, etc, is here to be had ..."
Has any HADAS member ever come across references to "the celebrated Hendon Floral Bouquet" (or to Mr Goldfinch, who sounds a man of many parts) before? On the whole these Victorian press cuttings give an impression of reporters being sent forth with instructions to mention every shop in the street, and not to miss one (could this have been with an eye to future advertising, perhaps?) As a-result the writers must have had problems: how do you, for instance, make one bulging butcher's shop sound any different to three or four others, equally bulging? In fact, the best description of a Christmas butcher comes from The District Times of Christmas Eve, 1891. "At North Finchley," it says "Mr H Griffin has an extraordinary fine show of meat. This shop is decorated with bunting and evergreens, and the stock includes, among other meat, two Devon oxen, fed by Mr E Homan JP of Friern Watch; and a huge porker (11 months old) and 9 pigs (14 weeks old) fed by the same gentleman. Mr Watson, Mr Pritchard and other butchers also have good shows of meat." In 1891 Finchley obviously still considered itself a village on the edge of the country, not part of the town. "Finchley cannot boast any very extensive places of business," the paper says, but nevertheless there are shops to suit the requirements of the district. At this festive season the proprietors are not behind town shopkeepers in dis­playing their stocks for Christmas." Some of the shops don't, in fact, sound all that festive; sometimes a reporter has to stretch things in order to give them a seasonal flavour. Take this description of Mr. J Jefferson's shop in Church Lane, Hendon, in December 1877: "Pull wires may get out of order from the constant ringing of the postman or other welcome visitor. Kitchen ranges may also, from the extra amount of work they are called on to perform, fail in their duty. To all families who find themselves in a dilemma in this respect, I can only commend them to Mr Jefferson. He has likewise a good supply of japanned wares, lamps, and plated goods, and should be busy- ..."
Mr Jefferson's shop was near the junction of Church Lane and Brent Street. Round the corner in Brent Terrace was the ironmongery recently taken over by Mr. E Smart from Mr. H Gedney. It is said to be at this time (1877) "the oldest business of its kind in Hendon," having been established 17 years before. a ten penny nail to a garden roller . Passing further along Brent Terrace, we are told that "one is attracted by the display of fancy goods, books, periodicals and con­fectionary which Mrs Faulkner .has to offer. Here also may be found the business of a tobacconist, and the Indian weed will probably be in high repute at this season of the year ...."
.How very Victorian "the Indian weed" sounds. On Wed morning (10 am-1 pm) the Prehistoric Group meets for regular processing of-the West Heath finds at College farm Fitzalan Rd, Finchley N3. All members most welcome, but please check first with Christine Arnott (455 2751) before you come to the farm, in case there has been any alteration in arrangements. After Christmas this Group will meet to discuss further projects, which will be announced in the 'Newsletter..
to her (55 Sunningfields Rd NW4. 203 0950). "1 would be obliged," he writes, "if you could shed any light on the 'location of either Whetstone Park or of a deep (350f-450') well dug: in Whetstone between, say, 1845-1870." An equally esoteric enquiry came from Mr Smeeton, who also lives outside the area. He specialises in the history of early tramways, and is chasing the plans which he knows were drawn at one time (but never put into execution) for a tram-turnround at Golders Green station for trams coming down from Finchley. He has tried all the likely sources like council minutes, London Transport records, etc, to no avail. If any HADAS member is able to help with either of these enquiries, please let our Hon. Secretary know. I am still in touch with Mrs Constantinides' sister, Miss. Dickinson, who lives in Highgate. The Dickinson's father had a private school in Highgate - oh dear, it seems such a long time ago: - which my brother and myself and Mr Constantinides all attended ...."
We would have been really delighted had it been possible for Miss Simmons to join us on our 21st birthday party next April - but, alas, she thinks arthritis will make that impossible. A century ago this month, on December 17 1881, there died, at his home at Fernhurst, near Haslemere, one of the best known Victorian architects, Anthony Salvin. He is of interest to HADAS members for several reasons. He had many links with Finchley. Long before anything like the Historic Buildings Council had been thought of, he was an authority on historic buildings; and his knowledge of the archaeology of the medieval period, specially its structures, was deep and detailed. Salvin was born in 1799, son of a general who belonged to a northern family which claimed that its ancestry came over with the Conqueror. The senior branch of the Salvins had held a Durham manor in unbroken succession since 1471. Anthony started, in a sense, at the top. He trained as an architect in the office of John Nash, architect of Regent Street and the Regents Park terraces. "It was not," his daughter was later to note, "at that time considered to be a profession for a gentleman, but his bent was so marked that his father determined to throw no obstacle in his way."' Calvin set up his own office in London in 1822; he worked from the capital for 60 years, first in Somerset Street, then in Savile Row and finally in Argyle Street. The restoration, renovation and alteration of ancient and historic buildings was his forte, and he was the acknowledged expert of his time on medieval military architecture. 'His commissions included many ancient fortresses; his work, for instance, can be seen in the towers of The Tower itself; and also at Windsor Castle, where his plans had to pass the eagle eye of the Prince Consort. He had a hand in the restoration of many castles, including Carisbrook, Caernarvon, Warwick and Alnwick, where he rebuilt the great Keep. He was architect to the Percy family for many years, and was responsible for all kinds of buildings on the Northumberland estate. He also designed the memorial to Grace Darling in Bamborough churchyard. He became a Fellow of the RIBA in 1836; .and in 1863 won the Institute's Gold Medal. On the historical side, he was a Fellow of the Society of. antiquaries for 57 years. Among his unsuccessful work was an entry in the competition for the new Houses of Parliament$ after the fire of 1834. It was for a building completely in the Tudor style. Salvin married his cousin, Anne Andrews Nesfield, daughter of the vicar of Brancepeth, Durham, in 1826; and seven years later the young couple moved to Elm House, later Elmshurst, in East End Road Finchley ­then a country road, bordered by hedges and fields, with occasional large houses. Elmshurst, which they took on a 60-year lease from Mr Rew,-.who lived next door at Knightons, was such a house, standing in 10 acres of ground 3 storeys high, standing some way back from the road, looking NE/SW, with a fine approach down an avenue of elm trees. It was shown on the 1866 25 in. OS map, on the south side of East End Road, just east of what is now Nazareth House (originally Knightons). Today Elmhurst Crescent (the central 's'has been dropped) commemorates the Elmshurst .name. "I come to the last part of my story: the passage by railroad from Coventry to London. It was performed in the short space of time between.1.30 and 7 o'clock, and we all agreed that the quicker it went the better, as its speed is its only recommendation. It passes through most uninteresting country, makes a most unearthly noise, sends forth now and then most offensive smells, passes through dismal dark tunnels and has an uneasy motion. "we reached Finchley at half past 8, having fasted 12hours, which was one reason, perhaps, for our abusing the railroad. A dish of hot mutton chops and warm tea made a decided change in our 'sentiments ...". May 9 1851. Went to the Great Exhibition. It is a most splendid place, quite passed any description. We were there 6 hours and never sat down once. I shall never forget my first impression: the glass and fountains, the trees, the humming noise of voices and feet, the colours, the masses of people and things all made an impression that I shall never forget. My dear mother was in ecstasies. A great many foreigners were there which pleased one. I saw only one Chinaman." The buildings for which Salvin was responsible in Finchley were Holy Trinity Church, in Church Lane, N2 - the parish church of East Finchley, which started building in 1846; Holy Trinity School, East . Finchley (1847) listed Grade II in 1973; and part of Christs College, Finchley. This was not the main school, with the copper-capped tower, on the south side of Hendon Lane - that was designed by Edward Roberts. Salvin designed, in 1860, a dining room and additional dormitories the original school (once the Queen's Head pub) which stood on the north side of Hendon Lane where Church End Finchley Library now stands. letter the original list had to be cut to five: We hope that once the Blue Plaque programme begins to roll it may be a continuing one. Then Salvin's name will be high on the next list. LIKE TO TIP-TOE THROUGH THE TULIPS? The Finchley Society is organising a trip to the Dutch bulb fields next spring and asks us to say that HADAS members will be very welcome if. they care to join it. 'The Group will leave Finchley on the evening of-Monday May 3, by coach, and will return on Sunday morning, May 9.The cost will be £160 per person, which will include most meals: and all travel and entrance fees. Further details of the varied programme and an application form can be obtained from Kurt Weinberg, 1 Brunner Close NW11 6NP. in November, when calamity nearly struck. Dr Ian Kinnes fell and tore the ligaments in his leg; he had to cancel his talk the day before he was due to give it. Into the breach, at 24 hours’ notice; stepped Dr Ann Saunders, a lady who wears her learning lightly. Without referring to a note or using a slide she captured her audience with her history of Marylebone, 1350-;1800: no mean feat, considering that many her hearers were pre-historians who had come expecting to hear about Neo-lithic Guernsey in the 3rd millennium BC. There wasn't a rustle or a cough in the hall while she was speaking -.though there were quite a few chuckles, as Dr Saunders has a nice sense of humour. In 1400 the church was moved further north, to what eventually became the New Road from Paddington to the City. The most likely reason for the move was that land cultivation had been extended northwards: it was thought better to have the parish church near the centre of the parish than on the perimeter (and a perimeter, too; troubled by footpads and unsavourily near Tyburn gallows). The new church was re-dedicated to St Mary the Virgin, or St Mary-by-the-stream; more often given as St Mary-by-the-Bourne, from which Marylebone., The first documentary use of the name- Marylebone found by Dr Saunders is in an inquisition post mortem of 1464 , but she feels pretty sure the name was in use before that. Next important character on the Marylebone scene is Thomas. Hobson, .one of Henry VIl’ new brand of civil servant." He had made his mark by settling the complicated estate of the King's mother, Margaret Beaufort after her death. Hobson obtained the freehold of Marylebone from the Abbey of Barking, paying 30s a year compensation for rent. He built a manor house, and by the time of his death had acquired most of the manor of Tyburn and had spent £1000 on his purchases. Came the dissolution in the 1530s and Henry VIII took Marylebone, giving Thomas Hobson II land in the Isle of Wight instead, to which he quietly and wisely retired. The King loved hunting and had his eye on a nice hunting ground near home. Geoffrey Chambers made a detailed survey for Henry VIII, showing 554 acres north of the village of Marylebone to be emparked as a hunting ground and surrounded with a ditch and bank. Edward VI put a fence on top of the bank. This is the land which is now Regents Park. Dr Saunders reckons that it is round because that's the way Henry VIII drew it on Chambers' survey to show what he wanted as his hunting park. By 1552 (when there is a rather pathetic inventory of the few goods owned by the parish church) there were 66 households in the village. Nothing much happened in Elizabeth's reign - the Russian. Ambassador went hunting in the park and stayed overnight in Thomas Hobson's manor house. James I, always wanting a quick buck, sold land south of the hunting park; and Charles I, also needing money, pledged the hunting park for £22000 for the supply of muskets and gunpowder. Cromwell, equally broke; sold the park to three of his officers, who cut down 15000 trees and sold the timber to the Navy or for house building. The roots were grubbed out and the land let in small parcels to soldiers for farming; the palings were burnt, the bank was levelled and the animals all got away. Mortimer, Henrietta, Cavendish, Harley, Bentinck, Margaret. In 40 years, by 1785, the area was built-up as far as the New Road (now the Marylebone-Euston Road, made sufficiently wide for cattle to be driven along it to Smithfield) and that marks the end of Marylebone as a village. Members who are working on research projects which deal with the northern part of the Borough will heave a sigh of relief at the news that, as this. Newsletter goes to press, the end of the alterations at Barnet Museum is in sight. Curator Bill Taylor tells us that he hopes to have, the museum objects and documents moved back by the beginning of March. There will then be an official re-opening, and the Museum will be in business again. If any HADAS members can spare time during January and February to help with the move back, please let Brigid Grafton Green know - Mr Taylor feels he might be glad of some HADAS assistance. Equally cheering is the information, from LBB Libraries Department, that the Borough Archivist, Mrs Joanna Cordenl who has been on leave for some-months, is due back in the Local History Collection at Egerton Gardens from November 29. We have missed her help greatly, and look forward to being able to call upon it again. The exhibits are varied - a walking doll, model train sets, animals, board games, musical boxes, an early gramophone, collections of stamps and cigarette cards. An adult hand can be seen in some of the pastimes – for instance in the four-panel scrap screen. (an extension of the scrap book idea) and in a partly built model boat. Altogether, an exhibition well worth a visit for children and adults alike. The Museum will be closed from Dec 24-29 inclusive; and from 4 pm on Dec 31 to 10 am on Jan 2. Anyone who expected the West Heath farewell party to be a sad occasion got it wrong. Archaeologists, are a resilient lot. one corner all the time, showing not only the human characters of the site but also the animal ones - like the ducks which adopted us in 1976 and the solitary hairy bee whose exploits, explained by Joyce Roberts, lightened many a tea or coffee break. There were photographic exhibits, a press cuttings book and all the tools and cores (except this year's, which are stillbeing worked on). They make a massive and most impressive show. And of course, there was talk - people who hadn't seen each other for years, people who had met only last week, but all with something to say and a considerable interest shared in common. Halfway through the afternoon a small presentation was made to the person who has been the mainspring of the dig for 6 years, our site supervisor Daphne Lorimer. We gave her a book token, a tiny trowel (there's a .saying among diggers "the smaller the trowel; the finer the troweller") and a card, drawn specially by Mary Allaway, of the West Heath scene. And, of course, we comforted ourselves with the thought that it isn't really goodbye West Heath yet there is still the report to complete and this year's finds to be dealt with. Our Librarian, June Porges, asks us to say that she will be at Avenue House East End Road, Finchley, on Friday Dec 4 from 8-9 pm. Please change books then if you would like to. Avenue House will be closed over Christmas and New Year, so she is arranging to be there on Monday Jan 4 (instead of Friday Jan 1) from 8-9pm. Souttar, R. The story of ancient Egypt and its neighbouring people, the Hebrews, Phoenicia, Carthage. Hodder & Stoughton, n.d.
Naspere, G. Art in Egypt. London, Heinemann, 1912. Petrie; W M Flinders. Egypt and Israel.-.SPCK, 1923. Petrie, W I Flinders. Egyptian decorative art: a course of lectures delivered at the Royal Institution. Methuen, 1895. Gaskell, G A.Egyptian scripture interpreted through language of symbolism present in all inspired writings. C W Danielt 1926. Roe D A The lower and middle Palaeolithic periods in Britain. Routledge & Kegan Paul, 1981. Renfrew, c (ed) British Prehistory: a new outline. Duckworth, 1974. As announced, a party of some 15 HADAS members visited the Physic Well at Barnet on Nov 6, wearing (on the Borough Librarian's advice) gumboots, carrying (at the suggestion of the Town Clerk's department) torches, and armed (on their own initiative) with cameras, sketch pads, clip-boards and bottles. You'd have thought we were off, at the very least to scale Snowden or chase the Loch Ness monster. The bottles by the way were empty when we went in; but coming out, Ted Sammes had filled them with the mineral waters of Barnet spring (said to be twice as effective as Epsom salts) which are now being analysed. The curious, octagon-shaped Wellhouse was built in 1937. There had, it is thought, been earlier buildings guarding the spring - probably the ground was first excavated and a chamber built in the mid-17th c; in 1808 an appeal was made for funds to provide-a shelter for the Well Chamber. 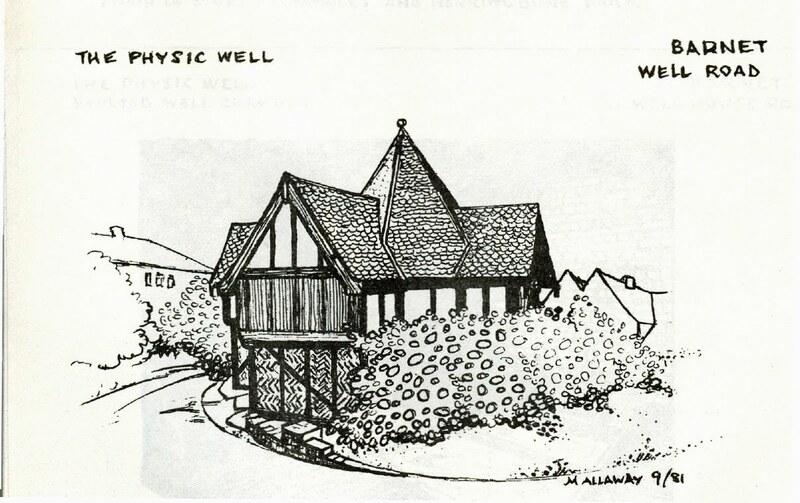 By 1840 the Well House (presumably built over the 17th a chamber) had been demolished, the chamber itself was covered with earth and the only thing to be seen was a small iron pump. We are indebted for the above facts to the Bulletin of the Barnet & District Local History Society of Nov 1976, in which Brian Wise gives detailed documentation -for the Well (copies obtainable, 26p inc. post, from Mr W S Taylor, 6 Mount Grace Road, Potters Bar). "The chamber was found in a perfect state of preservation. It was assessed by, the Council Surveyor and others as being typical of 17c architecture, an arched, or barrel shaped roof; spans the chamber and the whole is constructed of 'small, red, hand-pounced and burnt bricks. A flight of stone steps afforded access and there was accommodation for about 20 people. A sump, some 8 to 10 ft. deep, had been excavated and two rectangular basins built, into which the water from the spring percolates. Before the pump was installed drinkers were expected to stoop and help themselves by scooping the water from one of the basins, although Pepys was ministered to by a female attendant. The Council ultimately allocated nearly £500.and in 1937,the present shelter was erected, When Completed a representative of the Barnet Press sampled the water, in the course of duty, and found that it tasted very clear, very cold and somewhat grim.'" 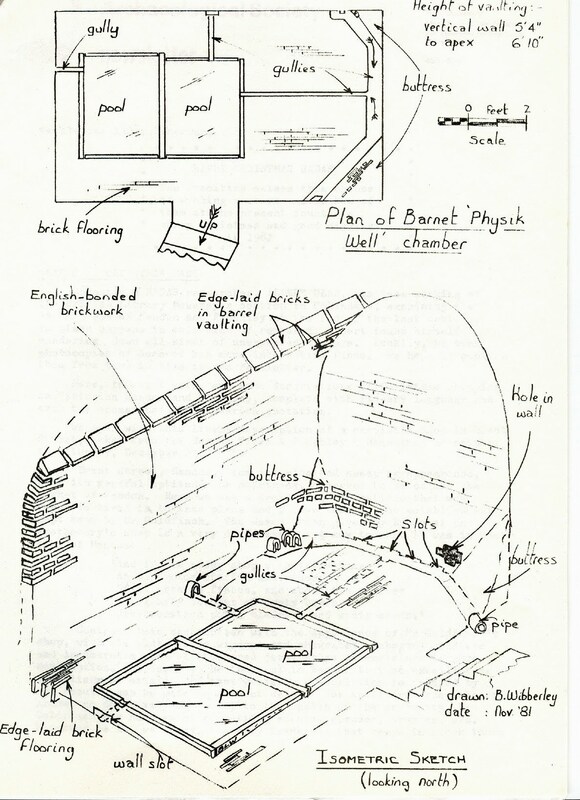 BRIAN WIEBERLEY makes these points about his isometric sketch (see the final page of this Newsletter), which gives an excellent idea of how the well-chamber now looks. 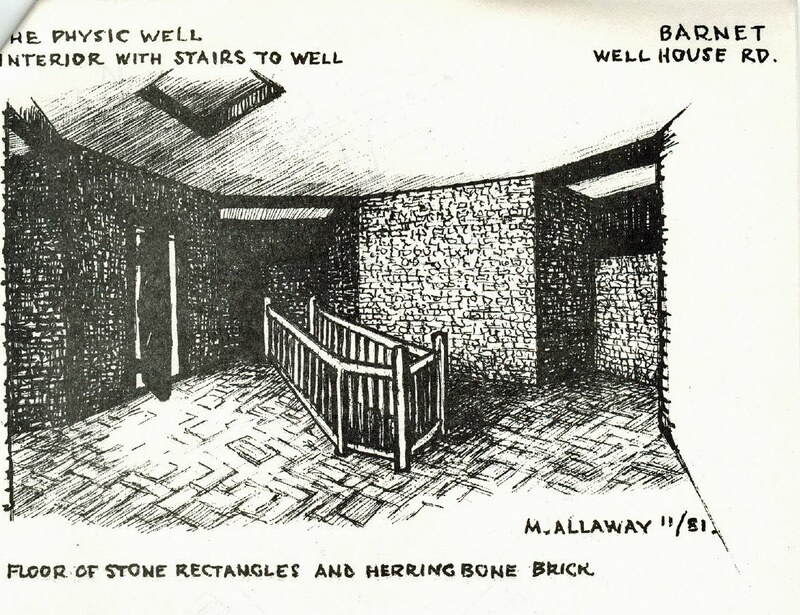 (It's a bit of luck that Brian and Mary Allaway have done their drawings from opposite sides of the chamber, so that they complement each other). 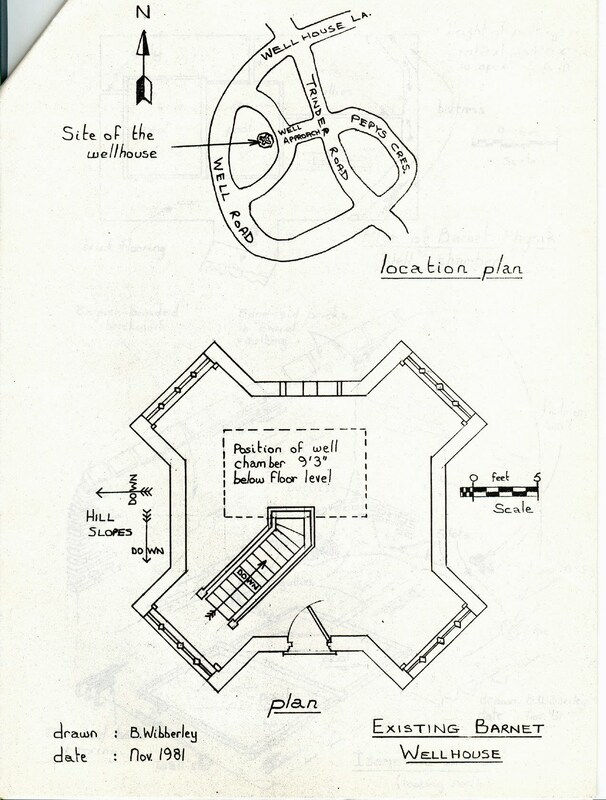 The sketch, he points out, is a cut-away view showing constructional details. The site of the bricks of which the chamber is made is approx. 8"x4”x23". This, and the English bonding style, is typical of 16c/17c vernacular building practice. Water-flow within the well chamber follows the fall of the hill in which the chamber is situated, roughly from NE to SW. There are two pools within the chamber which may house a spring, but which take waters from the projecting pipes at the north end. It is not obvious at present why there are two pools; perhaps one is for sedimentation of soil and debris brought down (or up) with the waters; or perhaps one was for drinking and one for bathing. The buttressed NE wall is interesting. At the base there are intent­ionally built-in slots which extend back into a cavity. A hole in the wall at the position shown in the sketch enabled us to look into the cavity behind, which appears to have been cut or eroded from the soil behind it. 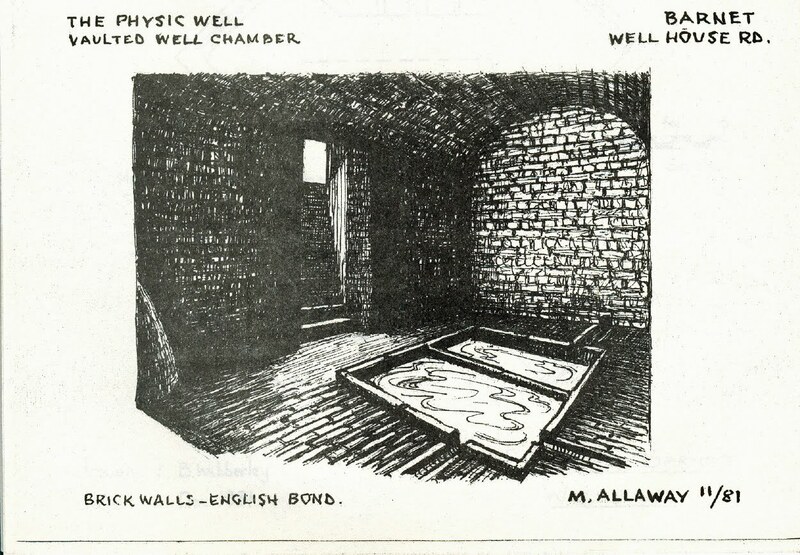 The preliminary visit was most interesting and whetted our appetite to look at both the well and the features of its chamber much more closely. We hope to have a chance to do so another time. The position at the moment regarding the Well and Wellhouse is that £350 has been allocated by the Borough for clearing the casual rubbish in the upper chamber and for re-decorating both inside and out. Once that has been done, some kind of plan for the Well's future will need to be drawn up by those who are interested in this unusual bit of Barnet's history.